Synopsis: John Callahan has a lust for life, a talent for off-color jokes, and a drinking problem. When an all-night bender ends in a catastrophic car accident, the last thing he intends to do is give up drinking. But when he reluctantly enters treatment with encouragement from his girlfriend (Rooney Mara) and a charismatic sponsor (Jonah Hill) Callahan discovers a gift for drawing edgy, irreverent newspaper cartoons that develop an international following and grant him a new lease on life. Based on a true story, this poignant, insightful and often funny drama about the healing power of art is adapted from Callahan's autobiography and directed by two-time Oscar® nominee Gus Van Sant. 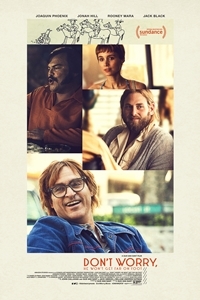 Jack Black, Carrie Brownstein, Beth Ditto and Kim Gordon also star.